I love the combination of white & black. I think this combination goes for a very classic and clean look. I added a touch of royal blue jewelery because Royal blue is my ultimate favorite color to wear! This white blazer has black pin stripe on it, however due to the quality of my camera you can not really tell. 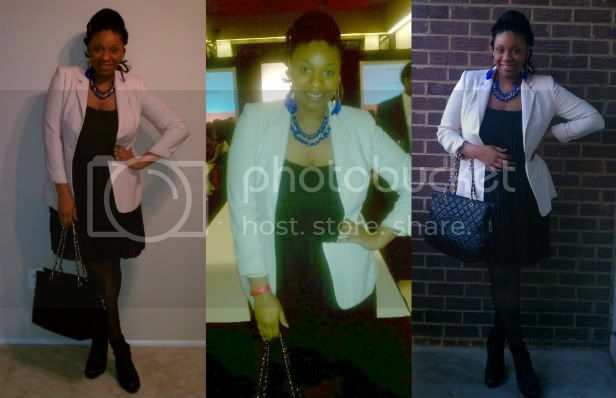 I will definitely be wearing this blazer numerous times, because it has become one of my favorite blazers in my closet! Choose the right color to match with yours dressing style can be great and if you mink fur leather jacket will be great and pretty charming brown hooded leather jacket women at cwmalls will be fashion! I'm personally a big fan of skinnyonfatshion blog. Thanks for sharing this post.